The society is extremely fortunate and it has its own dark site observatory called The Munday-Sayer Observatory. Located near Wakes Colne, society members have free access it, following an induction session to show you the ropes. The main dome houses a Celestron 11″ Schmidt-Cassegrain telescope and there is an pier mounted William Optics FLT110 refractor outside. Also included in the inventory is a 16″ GOTO Dobsonian reflector telescope and a Lunt Hydrogen-Alpha solar telescope. 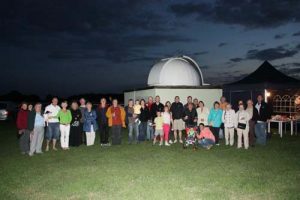 Information about access arrangements for the observatory can be found on the members only events page. Over the course of the past decade, the observatory building has been expanded, modernised and improved with new facilities and upgrades – largely thanks to the award of National Lottery grants, the Society’s outreach work, and the continuing support of our patron Val Sayer. 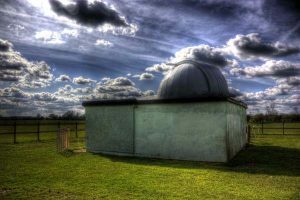 The observatory was originally built by Charles Munday during the 1980s, with the intention of observing Comet Halley. The site eventually came into the hands of Les & Val Sayer, who kindly gave access to the site for use by the Society. In honour of those people key to the development of the observatory, it was given the title The Munday-Sayer Observatory in ceremony in 2001. Since then the Observatory has been maintained and improved upon, with an outdoor observing area being added and several new telescopes. The observatory is named after two key people in its history – one responsible for its initial construction, one key to the Society gaining access to it. Charles Walter Munday was born Norfolk in April of 1915. He first worked at the Woolwich Arsenal, studying chemistry in the evenings. His interest in astronomy developed during his service in the Royal Air Force as a navigator during the Second World War. Post-war Munday joined the Distillers Company Ltd, later BP Chemicals Ltd, working on instrumentation – becoming head of BP’s Instrument Development Section. During this time there he invented and patented the “Munday Cell”, a device still in use today to chemically analyse and determine the oxygen content of a gas sample. He became President of the Institute of Measurement and received medals in the UK and the USA for his work in these fields. Charles Munday joined the British Astronomcial Association in 1952 and the British Interplanetary Society in 1957, but due to his work taking him overseas a great deal he was never able to pursue his interest in astronomy for some years. His special field of interest was in photoelectric observing and in 1975, upon retirement, he began to design and build his own observatory at his home near Wakes Colne for this observing work. He became Photoelectric Coordinator for the BAA’s Comet Section and for the International Halley Watch UK Amateur Observers Network. One thing that Munday’s career travel had enabled him to do was to visit many of the world’s leading observatories and he made contacts with many of the foremost astronomers of the time. Around 1980, he was able to visit NASA’s Jet Propulsion Laboratory in California and the Charles University in Prague to discuss collaboration with the BAA’s programmes for the observation of Halley’s Comet – which was to make it’s approach into the inner Solar System in 1986. Charles Munday had a number of projects in action. All his optical, mechanical and electrical work was of a very high standard, as you might expect from someone who had specialised in this field during his working life – he ground his own telescope mirror, built electronic camera equipment and had an electrically operated dome. He aimed to develop equipment and techniques to enable amateurs to make useful observations of comets. It is extremely unfortunate that he did not live to see the full return of Halley’s Comet, or to carry out the programme he had planned for its study. In August of 1985, shortly before the arrival of the comet, Charles Munday passed away due a brain tumour related illness. His advice and experience still formed the basis of the BAA’s programme and were of great value to the their successful comet observations. His contributions to the astronomy community, especially that of the amateur astronomer, were considerable and his observatory still lives on today as part of our Society. Following the passing of Charles Munday in 1985, his property at Wakes Colne was put up for sale. It’s eventual buyers would become of vital importance to the Society. Les Sayer, was a former Telegraphist Air Gunner (TAG) in the Royal Navy’s Fleet Air Arm during the Second World War – flying in the Fairey Swordfish, nicknamed the “Stringbag” because of the multiplicity of stay wires holding it together. TAGs were responsible for providing morse-code communications for the aircraft as well as protecting the aircraft with a machine gun. While stationed on the aircraft carrier HMS Victorious in 1941, he took part in the final, vital attack on the German battleship Bismarck. His squadron were part of the first wave which crippled the famous ship with torpedo bombing. He was awarded the Distinguished Service Medal (DSM) for the part he played. This and other memoirs were featured in the book “Tag On A Stringbag” which Les co-wrote. In the 1997 New Years Honours, Les was awarded the MBE for his service to the Telegraphist Air Gunner Association – a group set up to help the surviving TAGs. Upon leaving the Navy, Les spent over thirty years in a civil aviation career flying with airlines such as British European Airways (some of his journeys even took him into the realms of cold war espionage!) and being a training instructor for BOAC. In 1986 Les and Val Sayer purchased the land, including the observatory that Munday had built for observing Halley’s Comet. At the time of moving in they were fully occupied with maintaining and extending the property and thus had little time to think about the observatory, except that they eventually wanted to see it being used for the purpose for which it was built. One morning in 1990, members of the Society (then the Braintree Astronomical Society) broadcast an appeal on the Essex Radio Help Line show for help in setting up an observing location to which they could take their telescopes at night. They only really wanted a dark field to occasionally set up, away from the increasing glow of streetlights. As luck would have it, Les and Val Sayer heard the radio. “We have an observatory, would you like to use it”, they replied. They were both made honorary life members and it led to the creation of our Munday-Sayer Observatory. Throughout the past two decades the observatory has steadily progressed from a simple telescope dome into the building you see today. Les Sayer served as President of the Society until his passing in 2008. Val Sayer was made Patron of the Society in 2009. Both have contributed a great deal to the Society and supported the NEAS in its ambitions to develop the observatory – a resource that has made our Society somewhat unique. In 2011, the first Les Sayer Memorial Lecture was held at our Starfest event.